But fortunately, your wood stove causes more climate cooling than you might think too! 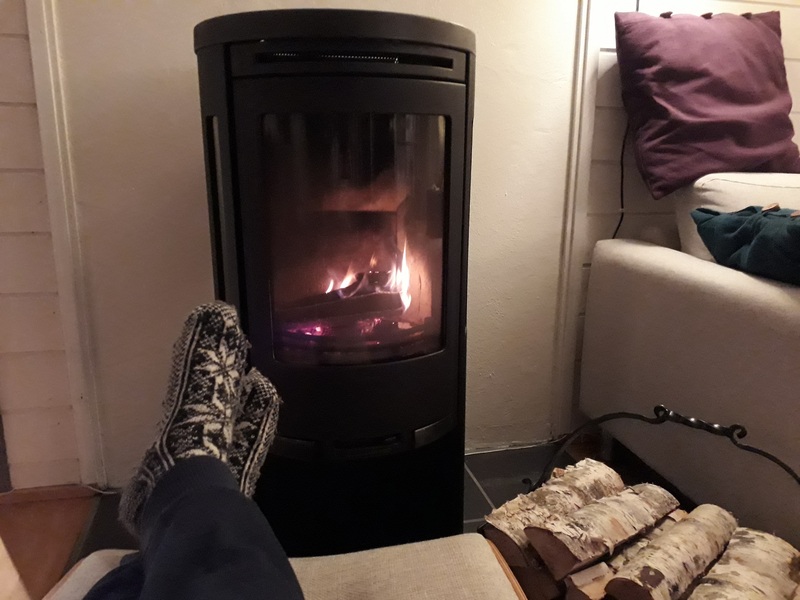 Our new study published in Nature’s Scientific Reports sheds light on the many ways in which residential wood combustion in Norway affects climate. So, I’ve stated that burning firewood causes both more climate warming and cooling than you might think. Several questions then beg to be answered: How is the warming brought about? How is the cooling brought about? And if we subtract the cooling from the warming, what is the net effect? And might this net effect be more significant than you think? I’ll address these questions but, before entering into specifics, let me introduce the two fundamental and general ways in which humans affect the climate. The most well-known way that humans change climate is via emissions of carbon dioxide (CO2), a so-called greenhouse gas. In the atmosphere, CO2 absorbs thermal radiation, thus reducing the amount of radiation the Earth can emit to space. The same is true for other greenhouse gases, such as water vapour and methane, but the magnitude and duration of the effects vary from one gas to another. The greenhouse effect falls under category B. Now we need an example for category A. Since the example for category B was related to emissions, let’s use a different example for category A. A forest and a forest trail. Photo from https://flic.kr/p/UXTVRp. As you can see, the trees appear dark (dark green). This is because the trees mostly absorb, rather than reflect, sunlight (green parts of light are reflected though, which is why the trees appear green and not black). The snow-covered forest trail in the picture, on the other hand, appears bright. This is because snow mostly reflects, rather than absorbs, light. 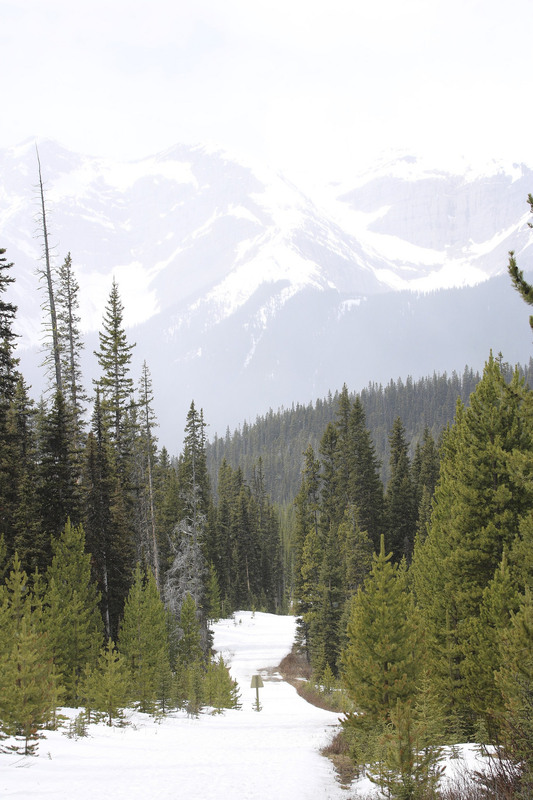 We can assume that humans have cleared the trees and vegetation to create the forest trail. Consequently, a smaller fraction of the surface is dark (dark green) and a greater fraction is bright; and less energy from sunlight is absorbed and more sunlight is reflected back to space. Reflecting the sunlight back means it doesn’t heat the Earth and the end result is climate cooling – and there we have our example of a category A effect. Next, let’s turn our attention to the climate effects associated with wood-fired heating stoves, keeping the above categories A and B in mind. Number 1: the greenhouse effect connected to CO2 and other heat-trapping gases. Contrary to popular belief, CO2 from burning renewable biomass such as wood can contribute to climate warming. Trees – being renewable – will reabsorb the CO2, but because they need time to do so, there can be a temporary warming effect. Although different to that of fossil CO2 (because fossil fuel stocks do not regrow), there is still an effect. In addition to CO2, wood stoves emit the greenhouse gases methane (CH4) and nitrous oxide (N2O). Stoves also emit carbon monoxide (CO) and non-methane hydrocarbons (NMVOC), precursors to ozone (O3), another greenhouse gas. We recall that the greenhouse effect (irrespective of whether it is from CO2, CH4, N2O and O3) is a category B effect. Number 2: harvesting wood from forests typically leads to an increase in how much sunlight is reflected from the Earth surface, and hence climate cooling, in the same way as described in our forest trail example earlier. This is the category A principle. Number 3: wood stoves emit tiny particles called black carbon. Black carbon gets its name because it absorbs visible light (hence “black”) and is pure carbon. By absorbing sunlight, black carbon in the air exerts a climate warming effect belonging to our category A. But there is more to black carbon: when it’s deposited on snow, the snow becomes darker and loses some of its ability to reflect sunlight – another category A warming effect. Additionally, black carbon interacts with clouds and thereby influences the climate system in complex ways. Number 4: black carbon has a sibling, called organic carbon. Opposite to sunlight-absorbing black carbon, organic carbon particles in air scatter sunlight back to space. In other words, organic carbon results in a climate cooling effect, one belonging to category A. The figure below shows estimated climate effects associated with residential wood stoves in Norway in 2010. 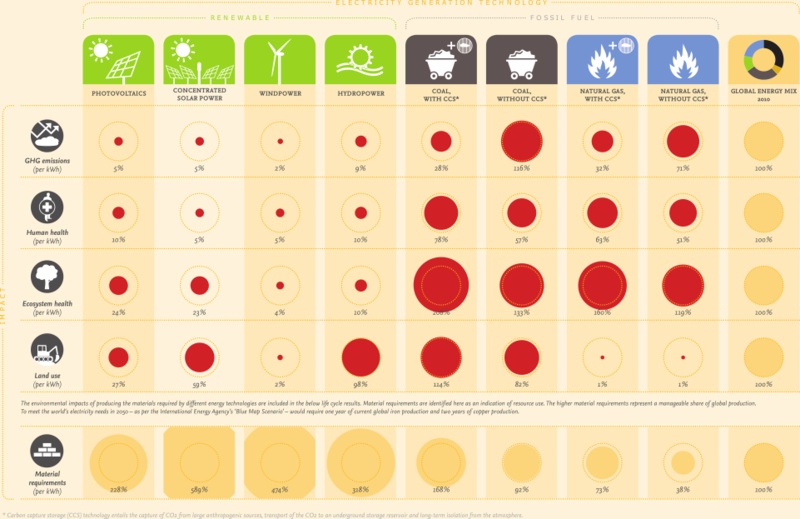 I’ll say more about the figure itself, but first a quick word on the comprehensive analysis underpinning it: Key elements of the analysis include an original set of emission factors for different classes of wood stoves, a mapping of wood harvest, supply and wood-stove burning activities, and a unique set of global warming potential (GWP) values. Our study combines these elements in order to analyse climate impacts of firewood burning on a national scale. GWP is just one measure that can be employed in order to study climate effects of different climate-altering pollutants and activities by one common unit, CO2-equivalents (CO2e). In our study, we use GWP evaluated on a time horizon of 100 years (GWP100), as GWP100 has been the metric of choice within climate policy to date. Annual climate impacts of wood stove bioenergy in Norway. Based on results from Arvesen et al. (2018). 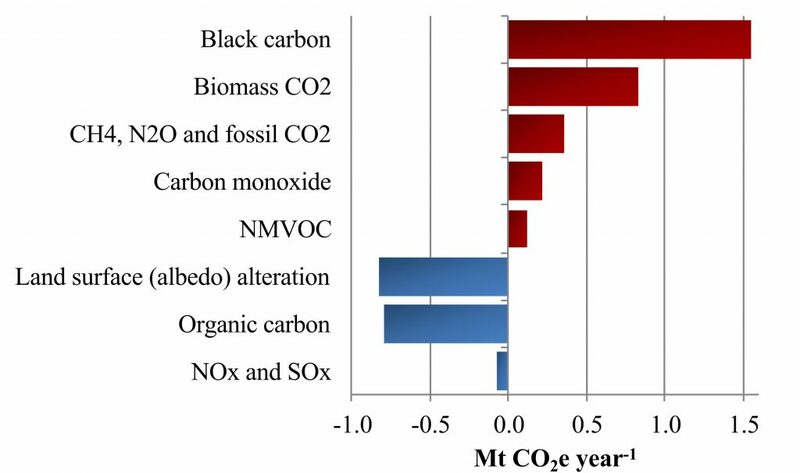 As you can see from the figure, the climate warming effects of black carbon amount to 1.6 billion tonnes (Mt) CO2e, which makes black carbon the single most important cause of climate warming impacts in our analysis. Another major cause of warming is CO2 from biomass, contributing roughly half the amount of warming as black carbon, while CH4, N2O and fossil CO2 from supply chain activities together contribute roghly half the amount of warming as CO2 from biomass. Considering all climate alterations, combined warming amounts to 3.1 Mt CO2e. Is 3.1 Mt CO2e a lot? To get a sense of the magnitude of this number, consider that Norway’s current total emissions of fossil CO2 – that is, from industry, transport and all other sources – amount to 45 Mt CO2. Also, bear in mind Norway’s pledge under the Paris agreement to reduce greenhouse gas emissions substantially (40% by 2030). Given that perspective, I would say 3.1 Mt CO2e is quite a lot. Fortunately, as the figure shows, land surface changes and organic carbon come to the rescue by bringing about considerable climate cooling effects. More precisely, we estimate combined cooling effects of 1.7 Mt CO2e. In other words, combined cooling offsets more than half of the combined warming effects of wood stoves. Where does that leave us in terms of the net (warming minus cooling) effect? The answer is 3.1 – 1.7 = 1.4 Mt CO2e, corresponding to 3% of Norway’s total emissions of fossil CO2. Is that more or less than you thought? Finally, our findings display a complex picture, and are subject to large uncertainty. For example, how you operate the stove has an effect, as does where you harvest the firewood from. Additional results that reveal these and further complexities can be found in our paper – which might be a more interesting read than you might think? The research was a collaboration between the Norwegian University of Science and Technology (NTNU), SINTEF Energy Research, Norwegian Institute of Bioeconomy Research (NIBIO), Norwegian University of Life Sciences (NMBU). It was funded by the Research Council of Norway through the Bioenergy Innovation Centre (CenBio). 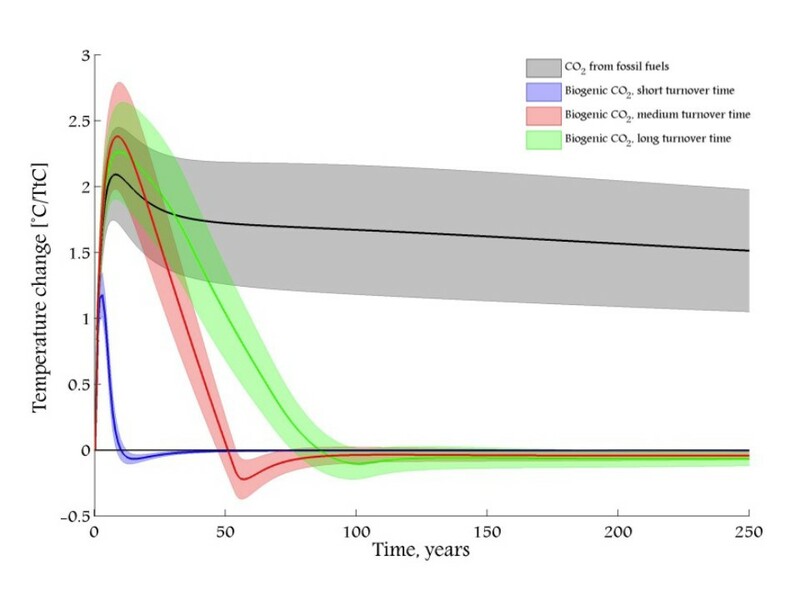 Figure source: IPCC AR5 WGIII. Available from: http://www.ipcc.ch/report/ar5/wg3/. 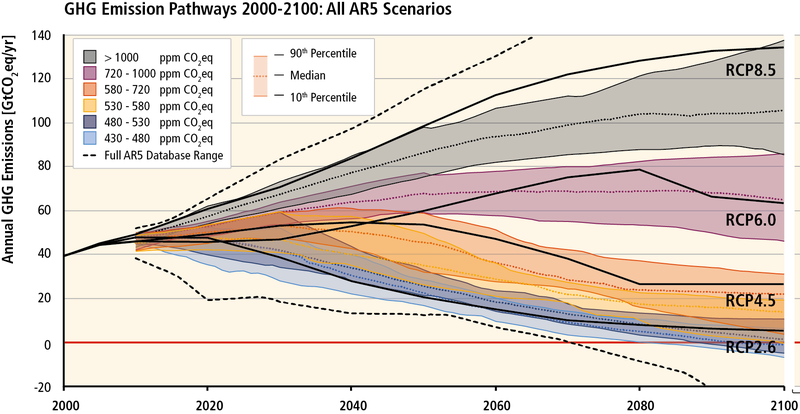 The above IPCC figure depicts possible future trends in greenhouse gas emissions. Underpinning this display is a set of well over a thousand scenarios. The range reflects different technological and economic trajectories, in addition to uncertainties. If we want to limit warming to no more than 2 ℃, we should look at the ‘RCP2.6’ path. How did the climate analysts produce this large collection of future outlooks? Not with crystal balls, but with an army of computer models. Or, somewhat more precisely, integrated assessment models. In a recent article, lead-authored by Stefan Pauliuk, we review these models from the perspective of our field, industrial ecology. Integrated assessment models (IAMs) are widely used to explore strategies for halting climate change. The models mimic human decision and mechanisms in natural systems over long time-scales. 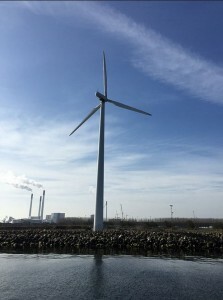 They operate by selecting or substituting alternatives – this can be natural resource alternatives or technology alternatives – so that costs are minimized, while respecting constraints, such as limited emission budgets. 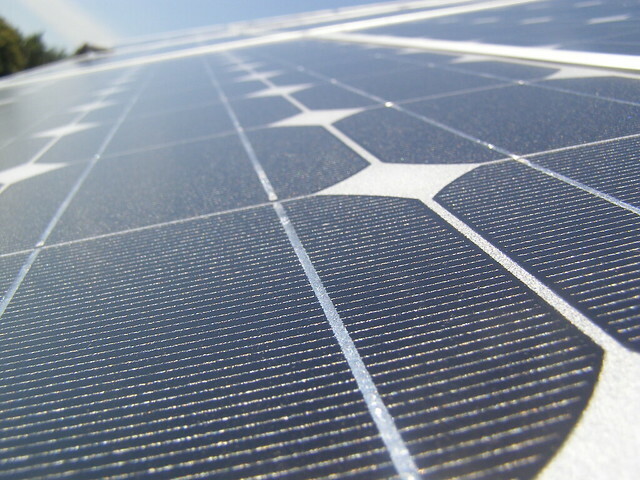 Among numerous applications, IAMs have been used to explore which fossil fuel reserves need to remain unexploited in a 2 ℃ future, to study the potential role of natural gas as a “bridge fuel” during a shift to a low-carbon society, and to compare energy system transformations in 2 ℃ or 1.5 ℃ futures. In industrial ecology, on the other hand, we study how energy and matter flow through society, how they are transformed or used in a network of industrial processes to satisfy human needs and desires, and how the natural environment is affected as a result. Key industrial ecology methods include material flow analysis (MFA), environmental input-output analysis (IOA) and environmental life cycle assessment (LCA). Some examples of applications of industrial ecology methods are: to analyse emissions associated with products and services consumed by households; to investigate resource use, emissions and wastes associated with developing and operating material stocks in the future; to study increased material efficiency (that is, to use less materials to deliver a given service) as a strategy to reduce emissions; and to analyse environmental impacts associated with future electricity supply. The IAM and industrial ecology fields are both concerned with understanding industrial systems. Such systems help to create goods and services that humans utilize. They also create emissions and waste. Looking into the future in order to evaluate possible strategies for sustainable development is, in a way, the heart of what IAMs do. Looking into the future is also at the core of what dynamic MFA is about, and is a growing trend in IOA and LCA. Furthermore, there is a shared ambition to address various types of environmental concerns, including greenhouse gas emissions, air pollution and water and land use. Despite their common interests, each modelling approach has distinct differences. IAMs are strong at representing the dynamics that shape evolutions in human and natural systems. They are cost-led and parsimonious, weighing the costs of alternative means to an end in order to identify lowest-cost solutions. However, with few exceptions, IAMs lack explicit descriptions of physical linkages related to capital stocks and materials. This includes relationships between capital stocks and the materials you need to build the stocks, between the stocks/materials and emissions associated with producing them, and the factors that govern material cycles. On the other hand, industrial ecology methods are less comprehensive in scope (and you could also say less integrated) than the IAMs. They focus their attention on specific types of linkages in industrial or ecological systems (as indicated in Figure 2 in our article), and often on specific products (LCA) or materials (MFA). Dynamic MFA is the only industrial ecology method that can generate scenarios itself; scenario-based LCAs and IOAs rely on exogenous scenarios as data inputs. Potential synergies between the two approaches exist. We believe that IAMs can generate more robust and credible emissions mitigation scenarios by adding industrial ecology linkages related to capital stocks and materials. We argue that, one the one hand, this can open the door for widening the set of potential mitigation solutions in the models, because material efficiency solutions – such as recycling, lifetime extensions, or using lightweight materials – can be added. On the other hand, it can introduce constrained availability of scrap for recycling as a new impediment to mitigation. In both cases where new solutions or obstacles come into play, model outcomes may become more realistic and useful for decision-making. Industrial ecology can make use of IAM scenarios to improve its capability to analyse future change. One way to do this is to apply industrial ecology methods to analyse IAM scenarios; another way is to integrating IAM scenario data into industrial ecology core databases. IAMs provide insights into cost-minimizing strategies – a major concern of policy makers – something that industrial ecology does not offer frequently. Environmental impact assessment methods developed for LCA have a potential to broaden the range of impact types considered in IAMs, while IAMs can be used to capture cross-sectoral interactions that matter for environmental impacts, such as between food and bioenergy production. Further discussions of potentials for interaction and improvement are available in our article. In summary, IAM and industrial ecology share several important common interests, but employ entirely different approaches to achieve them. In our article, we call for more interaction between the integrated assessment and industrial ecology communities to the benefit of sustainability science as a whole. Full article citation: Pauliuk, S., Arvesen, A., Stadler, K., Hertwich, E.G., 2017. Industrial ecology in integrated assessment models. Nature Climate Change 7, 13-20.